While many business schools offer entrepreneurship classes and even majors, there haven’t been any schools dedicated entirely to entrepreneurship — until now. This semester, Drexel University in Philadelphia opened the Charles D. Close School of Entrepreneurship, America’s first stand-alone entrepreneurship school. Currently, 15 students are enrolled as entrepreneurship and innovation majors, with nine additional students working toward one of the school’s four minors, Philly.com reports. While many business programs, including Drexel’s own Bennett S. LeBow College of Business, offer entrepreneurship courses, Close gives students a chance to learn the ins and outs of being an entrepreneur on a much deeper level. In a typical business program, students might take six to eight entrepreneurship courses. But at the new school, they are able to take 20 to 25 specialised courses, says Chuck Sacco, Drexel’s entrepreneur in residence and director of external relations for the Close School. The freestanding school also gives students a chance to explore aspects of being an entrepreneur that are often overlooked in other programs, including soft skills such as networking, team building, presentation skills, and creativity. “It’s a very immersive program, and that’s why it’s separate from the business school,” Sacco says. The opening of such a school highlights a larger trend in business: the growing popularity of entrepreneurship as a career path. It’s no longer the norm for employees to stick with the same company for decades; Sacco estimates that some students will hold at least 10 jobs between graduation and the time they turn 35. Because of this, many recent college graduates turn to entrepreneurship as a means of forging their own career paths and taking control of their futures. Maria Halpern/WhartonPercentage of Wharton MBAs pursuing their own businesses right after graduation. This trend toward entrepreneurship isn’t just happening among undergraduates. 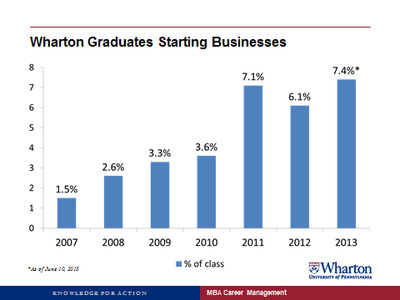 MBAs are also starting their own companies at a much higher rate than ever before. One study of graduates from the University of Pennsylvania’s Wharton School found that five times as many MBAs started their own companies right away in 2013 than in 2007. At North Carolina’s Kenan-Flagler Business School, one-fifth of 2014 graduates held a concentration in entrepreneurship.